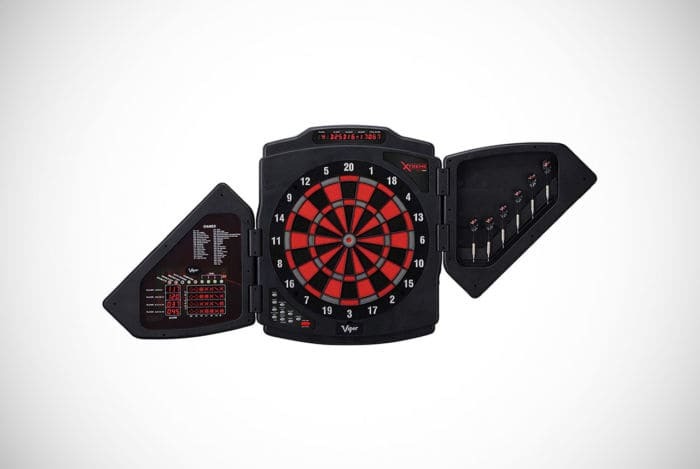 What type of electronic dart boards are available? 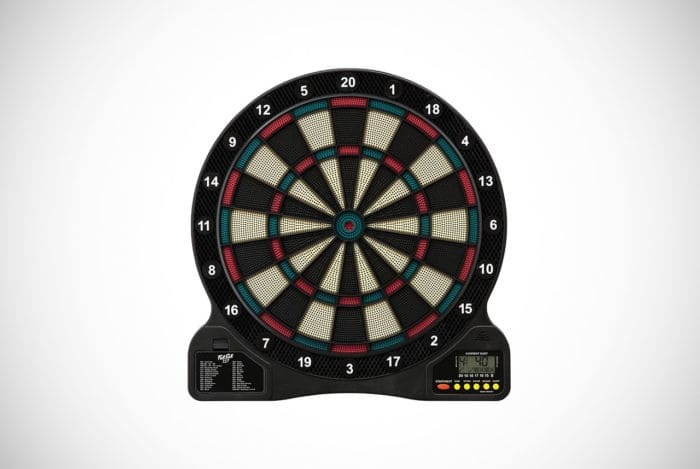 What to consider when buying an electronic dart board? Who doesn’t love a good old game of darts? In our humble opinion – only fools! Darts have been extremely popular for many hundreds of years. It’s a pastime that just about anyone can enjoy, because although it takes skill to play it well, it’s incredibly inclusive. After all, at its most basic it involves throwing a dart at a board. It’s hardly as technically skilful as games like tennis, trying to serve and volley like Federer. Aim, chuck and hope for the best. At least, until you get better. Whether it’s between friends or at a family party or social gathering, darts is a great way to get those competitive juices flowing. While keeping things fun. One of the issues, and the cause of many dartboard-related fights, disputes, arguments and tantrums, is the scoring. Enter the fantastic electronic dart board. As the scores are automatically logged, gone are the problems with people forgetting to mark points down and calculating the scores incorrectly. We won’t name and shame the guilty parties. We’ll just avert our eyes from their treacherous gaze. Computers, though, are never wrong! (We’re going to omit Skynet, HAL and GLaDOS for obvious reasons) What’s more, electronic dart boards are much safer than their bristle board counterparts, making them the ideal choice for all the family. 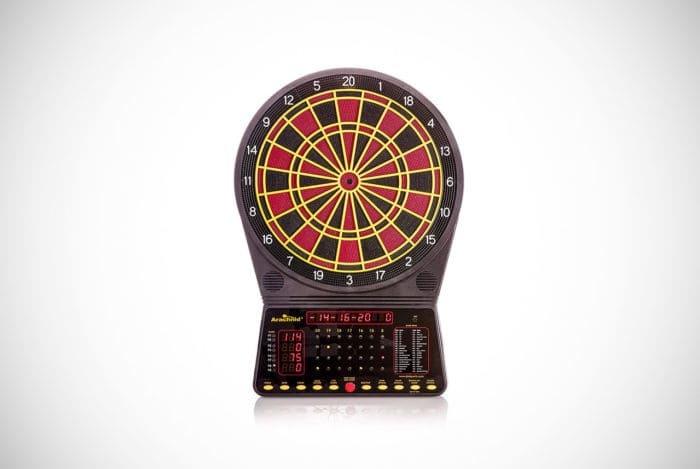 As electronic dart boards have grown in popularity, particularly among younger generations and families, there’s now a huge variety to choose from. Choosing just one out of so many options could fry your brain before you even get to throw a dart. That’s why we’ve taken the liberty of doing you a solid and bringing you our reviews of the best electronic dart boards available in 2019. If you’re not looking to spend too much and just want a good game of darts, this is the one. This is for the true darts fans and not for the fainthearted, but a classic-looking arcade take on electronic dartboards. Let’s start as we mean to go on with this badass Harley-Davidson electronic dart board. Fully emblazoned with the Harley logo and lots of fire, this is one perfect addition to any self-respecting biker or rock ‘n’ roller’s man cave or games room. It looks awesome, it’s true, but it also offers a plethora of great options and features to give you and your buddies hours of fun and games. 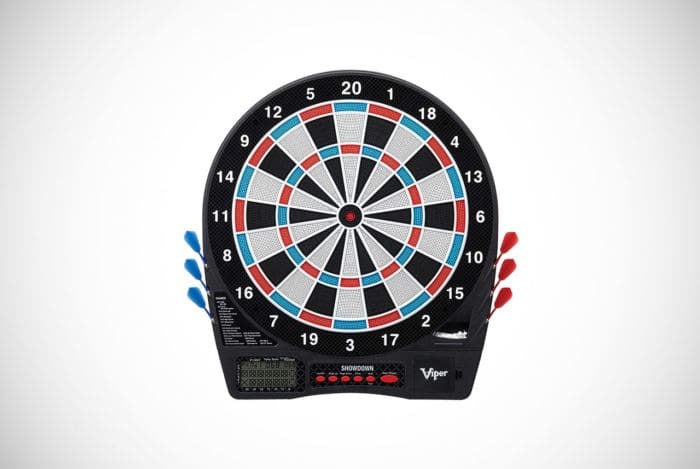 High-definition graphics and colors provide a suitable backdrop for an electronic dart board that can track the progress of up to eight players, while offering 48 games. Gone are the chalkboards and notepads, as there’s a crystal-clear four-color LCD scores panel. Wanna know something extremely cool about this, amigo, that makes it all the more a worthwhile investment? When you either hit the bullseye or completely win a game, it makes a noise. Not just any noise though – a Harley-Davidson engine revving noise. Don’t tell us that doesn’t excite you! We’d never believe you anyway. The board comes complete with everything you need to get started, out of the box, including the required AC-adaptor and six Harley-Davidson darts. You even get extra tips and a rulebook. Who can argue with that value? 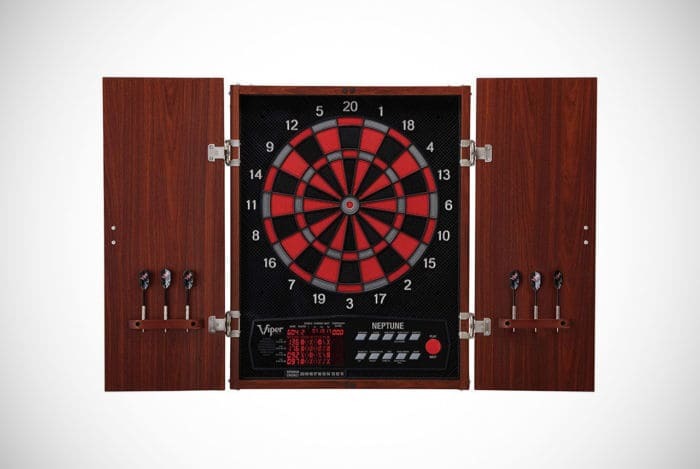 Next in our guide is this much more intense and feature-filled electronic dart board cabinet from Fat Cat by GLD Products. 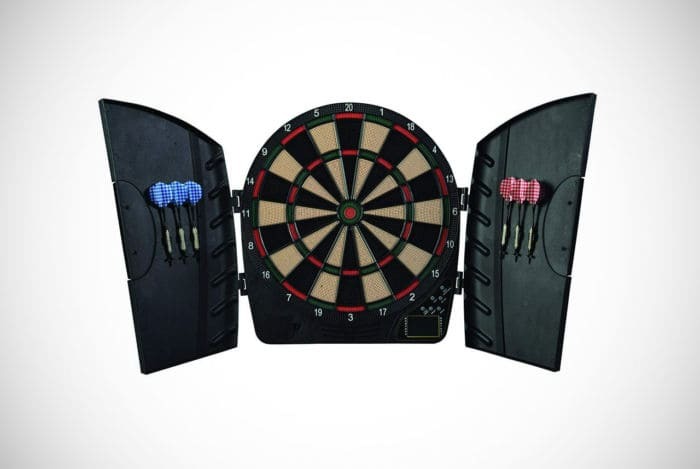 Rather than just being an electronic dart board, it’s a full-on dart board and unit with doors that close over, hiding it in plain sight, when you’re not using it. Briefly on the doors, they’ve got a nice wooden curved finish, so if you’re looking for an electronic dart board to place ion your main living area, this might be a great match aesthetically. In terms of the playability offered by this board, you and seven friends or relatives can play together without any hassle or fuss. There’s 34 different games and 183 scoring options, with five skill levels. Thanks to the ultra-thin spider and concave segment holes, bounce-outs are less likely. Everything is operational from the easy-to-use control panel and in addition to the LCD display at the front, there’s also traditional cricket scoreboard on the interior of the cabinet door. The build quality from the bottom up is outstanding, with built-in slots on the doors that can store a maximum of four sets of darts. With the board and cabinet, you are supplied with the necessary mounting hardware, the AC-adaptor, six darts and six additional tips. What sets the Viper X-Treme apart from many of the others out there is that it features a full-size regulation 15.5” dartboard face. With commercial standard nylon segments, you not only have access to a much quieter game surface, but also a more durable one. Like the above, there’s extra-thin spiders that reduce the number of potential dart bounce outs and allowing you the opportunity to aim darts at the same section as others you’ve thrown to get the best scores. 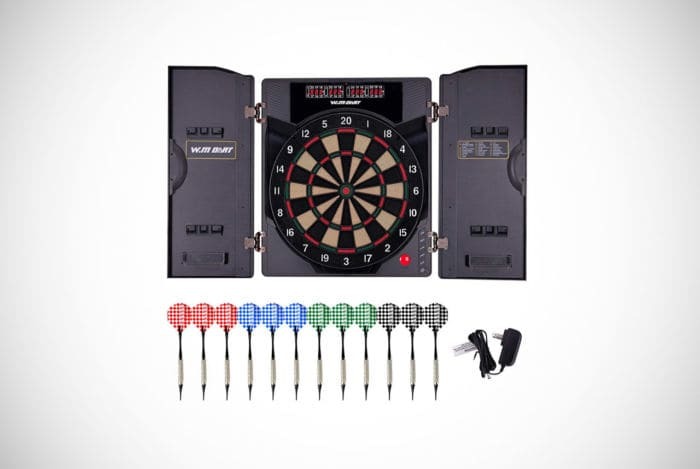 With it capable of handling as many as 56 games and there being 266 different game options, you and a large group of 16 can enjoy an exhilarating game of darts. Some popular game options include double bull, double in/out, single in/out and cricket. From the LCD display you’ve got full access to not just the current scores, but statistics too. As is standard for many of these, you get 6 darts, 24 additional tips, the necessary mounting hardware and an AC-adaptor. Regardless of whatever your favorite version of darts is, this is a cool board that you should look at closer. Another regulation size board, the Viper Neptune with 15.5-inch target face. This is another that has closing cabinet doors, a nice decorative piece that would help the dart board fit in with your décor. Whether you’re intent on hanging it in your games room or more general living space. It has the same very slim spider that helps lower the risk of bounce outs, meaning darts can be grouped together on the board more easily for higher scores. As well as these design elements, the dart board benefits from handling 57 games across 307 different option settings, and a total of 16 players can play at the same time. The LCD display notes scoring, statistics and is very easy to use. All in all, if you’re looking for a sophisticated electronic board to fire darts at whether it’s a way of chasing frustration away or for some friendly competition among family and friends, this model’s an ideal choice. There’s even an extended and new way to play Cricket, called Spanish Cricket. It comes with the cabinet, the necessary mounting hardware, the AC-power adaptor, along with six soft-tipped darts and places to store them in the cabinet, in both doors on the inside. Next in our guide is this very traditional-looking, tournament-size board with a 15.5” playing face that will suit players of all levels. The first thing you’ll notice about this board is the price. Compared to the others we’ve featured so far, it’s considerably cheaper. Although that does mean you get less games and options, what it lacks in quantity, it makes up for it in quality. 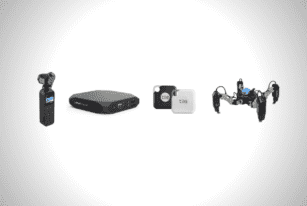 It’s been designed to be very easy to mount on the wall and play, virtually out of the box. The games that are included amount to 28 with more than 100 options. So, there’s still some variety. The LED Cricket scoreboard keeps track of score, so you don’t have to. All you need to do is aim and throw those darts. To the sides of the board, there storage holes for the darts to be kept, so you’ll never lose them. As standard with most electronic dart machines, you get a set of six soft-tipped darts and six replacement tips too. For the price, the quality and the design this is an excellent choice. Slightly higher in price than the above, but still lower in price than many of the others, the Arachnid Cricket Pro 300 is one that is spoken about with dart enthusiasts and beginners alike. 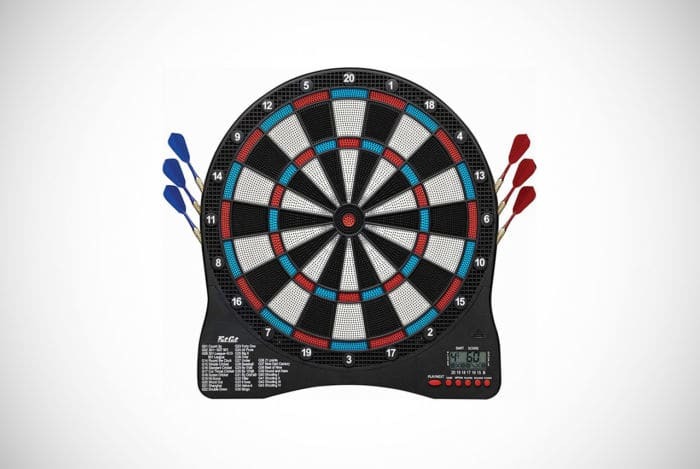 With a 13.5-inch target area and a range of 26 different games and 170 options, including seven Cricket settings, this is an affordable and fun dart board. It benefits from having very thin segment dividers that reduces the risk of bounce outs exponentially. With the LED display, players can keep track of their scores and the computer even calls out recorded player names, which is a nice touch. Like others on this list, it comes complete with additional tips and six soft-tipped darts. You’ll also find all the mounting hardware included, so you don’t have to make unnecessary trips to your local hardware store. Another great dartboard from Fat Cat next. This has a 13-inch target area and the obligatory catch ring for missed darts that saves your walls from all those unwanted holes. As this is by far the lowest price in our guide we’ve covered so far, it’s not got many games, but does have a lot of options for the settings, so there’s still plenty of variety to be had. Like many of the modern electronic dartboards in this guide, it’s got thin spider and polymer compound segments that have been target-tested to ensure you can hit the board without bounce outs occurring. Even, given its smaller size and lower price than others, the scoring display screen is exceptionally bright and easy to use and read for your cricket scores as you play. As you’d probably expect, even for under 40-bucks it still comes with six soft-tipped darts, although the batteries that it requires, 3 x AA, are not included in the package. Back with Viper again and another awesome regulation-size board with a 15.5-inch target area. The segments are also made from competition-standard thermal-resin to provide an incredibly durable surface to play on. Combine that with the extremely-thin spider and you’re sure to have a great board to play with the minimum bounce-outs, if any. The board, like so many others, has handy storage spots for your darts at either side. When it comes to games, you need to remember that this is another budget-priced board, so there’s not as many as you’d get on more expensive boards. However, with 43 in total and 240 settings, there is more than enough variety to have a whole lot of fun with this product. 16 players can play at the same time and the LCD display screen will keep track of all the scores and statistics, so that you don’t have to. Especially handy, if you’re having a beer or two while playing. You get six soft tip starter darts, additional tips and the mounting hardware to install on the wall. In addition, as this does not require any batteries, you also get the AC-power adaptor required to use it. Arachnid are one of the originators of the electronic dartboards. This one is a great addition to any home, especially if you’re not interested in having a tournament-ready board and just want something to do on rainy nights and when you have social gatherings. There’s not many differences between this one and others. There are only 13 game styles to choose from and you get six soft-tipped darts, red and black so that there’s no confusion. The most striking thing, and fun, if you like that sorta thing, is the ‘heckler’ function. Yes, that’s right, this board will heckle you if you get low scores or play a stinker of a game. This can be annoying for some people, but others will find it hilarious. Especially if you’re getting a little tipsy with your mates and the competitive juices are flowing. Another great option, if you’re at home alone or in the office on a break and looking to unwind, is the chance to play a solo game. All you need is in the box and it’s ready to go, almost from the moment you take it out. 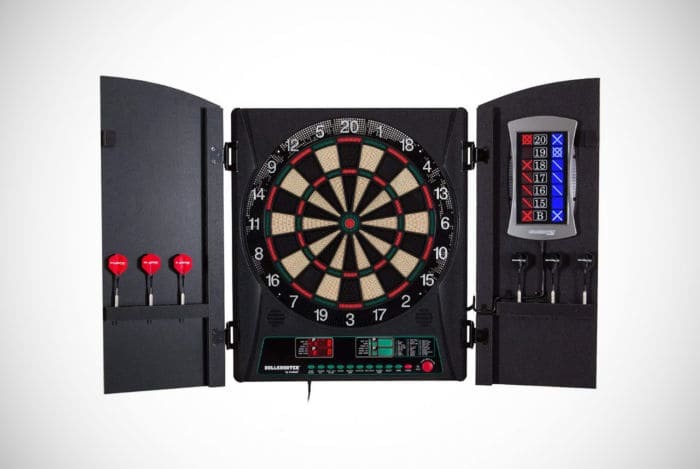 Sitting at just under 100 bucks, this electronic dartboard cabinet set from Arachnid and their Bullshooter range is not the most expensive or the cheapest either. It’s a nice happy medium price. What does it offer? Well, you get access to 34 different games and 183 settings, including 4 cricket options, that accommodates as many as 8 players at a time. As with the above model, there’s the option to paly solo so you can hone your skills more and it also comes with the heckler feature. Admittedly, an electronic voice shouting and pointing out your worst throws and shots might get annoying after a while. Therefore, it’s great to know that you can switch it off, if you want a break from the constant down talking. In terms of scoring, along with the digital screen, there’s also the traditional pub-style X/O cricket scoreboard mounted on the doors for a more authentic feel and game. Speaking of the doors and the cabinet design, this gives it an extremely elegant look and feel. So, whether it’s destined to go on the wall in your man cave, games room, office or even living room, it’ll not detract from the existing décor. The sophisticated cabinet, as well as providing a way to hide it when not in use, provides a place to store your darts so they don’t get lost and you’re not tearing the house apart trying to find them just to have a quick game. Back with Viper again for another tournament regulation-size board. 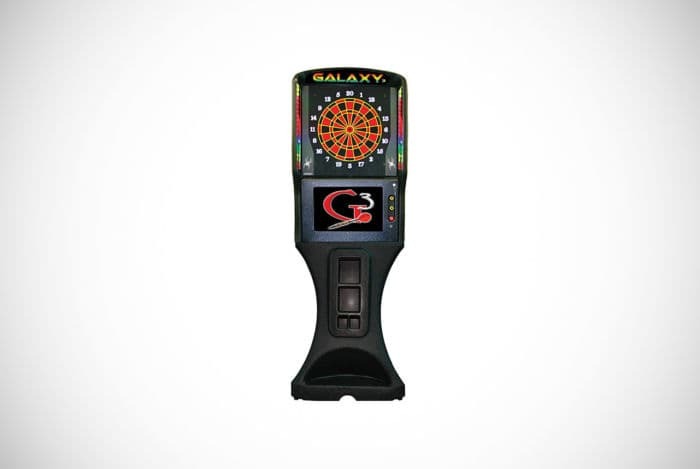 This electronic dartboard has a very bright appearance and offers a versatile range of 32 games and 590 settings, with room for as many as 8 players to play at any one time. 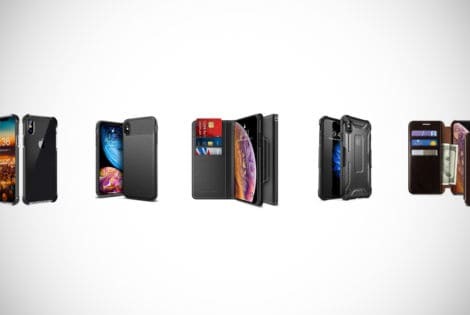 Despite its low-ticket price, it still features thermal-resin segments you’d find on competition standard boards and due to the ultra-thin spider in its design, there’s less chance of bounce outs occurring. Do you often miss the board when firing shots? On a traditional board that might mean your wall would get harm and abuse. However, as this board has a generously-sized catch ring for missed darts, your walls are safe. Viper Showdown is a gem that’ll get your blood going when there’s that competitive spirit in the air. The LCD display will ensure that scoring is handled in a fair manner and you can even keep track of statistics, if you’re interested in that sorta thing. You get the standard six soft-tipped darts and mounting hardware to get started with this board. However, you will need to remember to invest in batteries, as it takes 3 x AA that are not supplied. 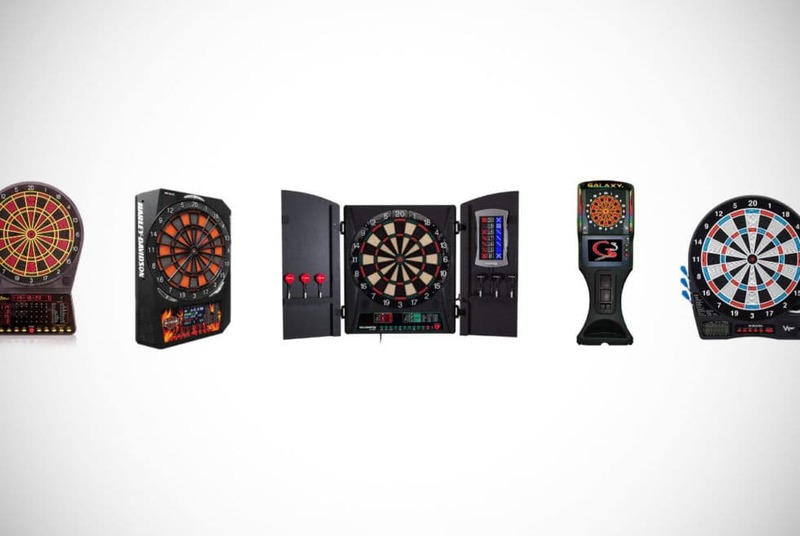 If you’re looking for a way to beat those winter blues and want to bring the games hall and old-fashioned pub feel to your home, whether it’s in your man cave or main socializing area, you might want to consider the Win.Max electronic dartboard cabinet. It features an easy-to-use and read control unit and LED screen that is incredibly bright and provides you with crisp and accurate scoring and game statistics. 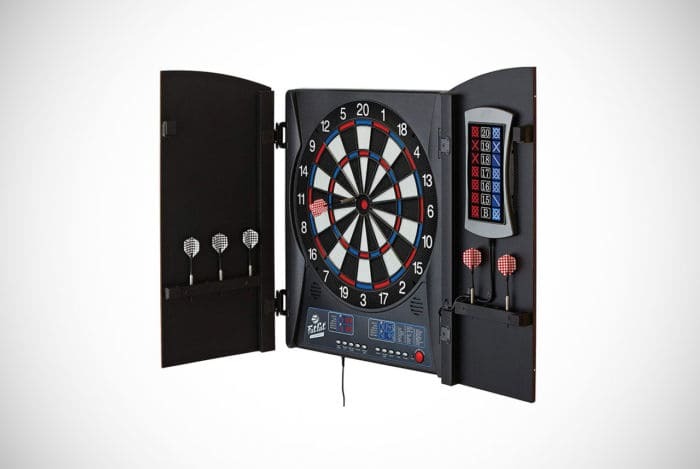 It supports play involving 8 people at a time and comes with 27 preset games and 195 different scoring settings, to really give your darts and games nights versatility. The addition of five different skill levels adds an extra element of excitement to it. The construction quality of this board Is very high, with concave-shaped segment holes and an extremely thin spider to reduce the number of bounce-outs. For the less experienced and younger players, there’s a catch ring that provides additional space for your darts to land if you miss the target face, protecting your walls from damage. The ABS cabinet not only hides the board away but has slots for storing as many as four sets of darts and all other associated accessories when you close it up and aren’t using it. To get you started, you are supplied with 12 soft-tipped darts, 40 additional tips, user manual and mains adaptor. 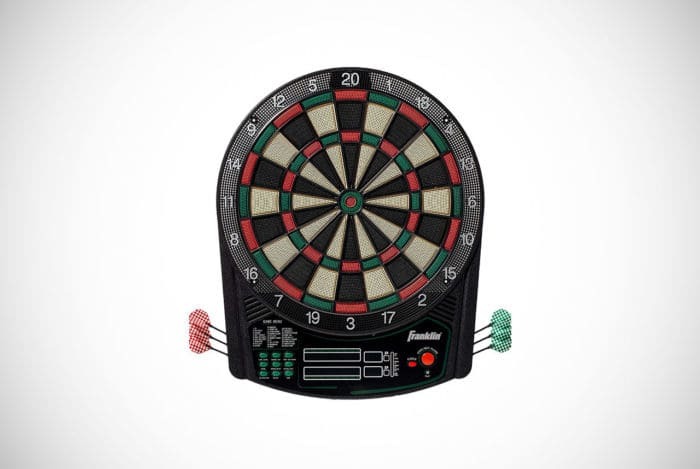 Are you thinking that you’d love to invest in an electronic dartboard, but are looking to avoid spending as much as 100 bucks or more, then this affordable model from Franklin Sports is an ideal choice? Despite the low-price tag, it still measures at 13.5” and features the sound and voice affects you get in higher quality, higher priced boards. It has a really streamlined design and construction that means it doesn’t take up more space than is necessary. Which is great if you’re looking to have it in a small office, an already busy and full games room or your living room. Even for the price, there’s 90 game options so you’ll have plenty of fun whenever you open those darts up and get throwing those darts. Also, for the price, there’s a generously-sized LCD display that allows you to keep up with the score, meaning you don’t have to use a notepad or even a chalkboard anymore. Well, you could, if you wanted to, but there could be discrepancies between your score keeping and the computer! 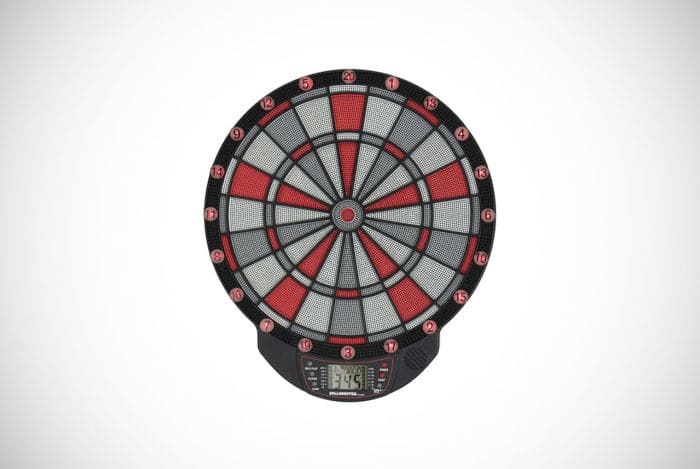 Arguably one of the lowest priced electronic dartboards on our list, the Fat Cat Sirius is an awesome treat for the whole family or those game nights with your buddies in your man cave. Despite its low price though, you still get a tournament-style spider and 13” target face. The LCD display is bright and clear and offers cricket scoring and fun sound effects. With regards to gameplay, as many as 8 players can play at one time, with the choice of 18 preset game styles and 114 options for scoring. So much versatility and so much fun for such a low price. Can you really argue with that? As standard, you get a user manual to help you navigate your way round the controls, along with six plastic starter darts and 24 additional soft tips. However, the only major downside is that it is powered with 2 x AA batteries and as it doesn’t come with these, you’ll have to invest in some. But, for such a low ticket-price, is that really a big issue? 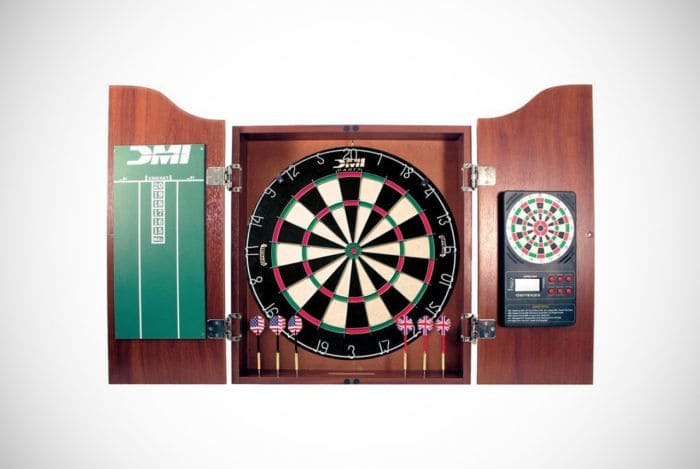 Now, with so many electronic dartboards that look more or less the same, this next one from DMI Sports is a bit of a breath of fresh air. 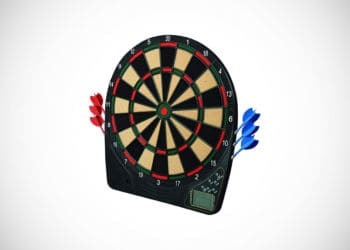 It must be said that as the only element that’s electronic is the included electronic scoreboard, this will suit someone who’s looking for that traditional bristle dartboard with the help of technology, without taking away from the look and feel. What really makes this stand out, apart from the traditional design and construction and the option of both electronic and traditional scoring, is the light cherry finish on the cabinet. The dartboard itself is a full-size 18-inch by 1 ½-inch bristle board and it comes with two sets of darts. When you’re not playing, you can simply stick the darts in the slots along the bottom of the cabinet, close the doors and it’ll be hidden in plain sight. 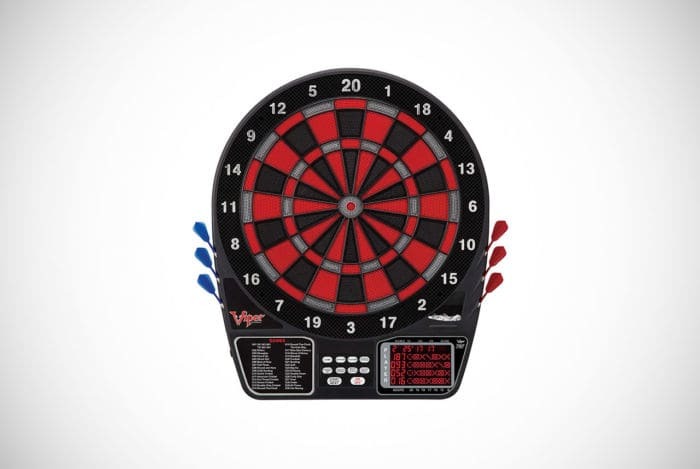 Although this guide is all about electronic dartboards, this is one of our favorites. We’re sorry, but not sorry. This will suit someone looking for a bridge between that traditional dart experience, with the sound of darts hitting the bristle board and more accurate scoring. Unlike the above model, this from Franklin Sports is most definitely an electronic dartboard that features everything you’d expect from a higher priced item. 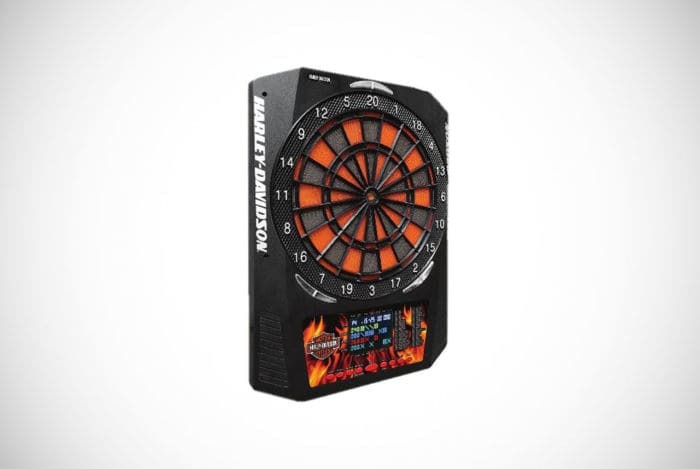 It features a 13.5-inch board, provides sound and voice effects to bring the dart game experience to life. 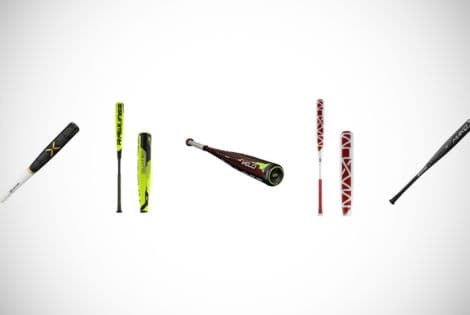 For versatility and ensuring that you’re not left playing the same game styles all the time, as it provides you with as many as 65 different game options. That should be more than enough to keep you and your friends or family entertained for hours. The screen is large enough that reading the scores is easy and it’s also been deigned to be easy to use when you’re switching between the various game options and skill difficulties. 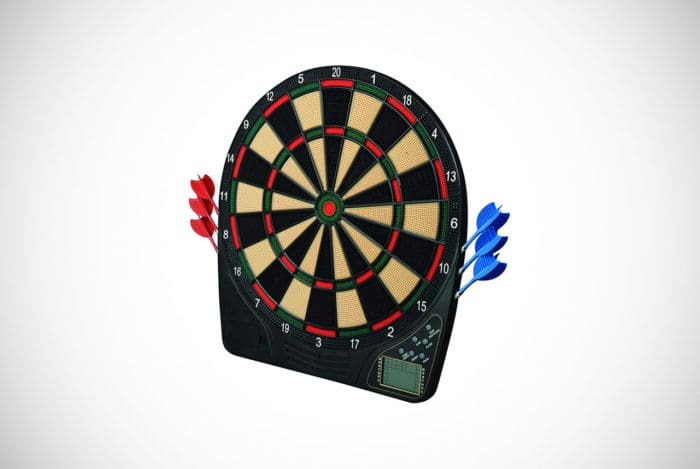 The board comes with six soft-tipped darts but does not come with the necessary 2 x AA batteries it requires. However, for such a steal of a price as under 30 bucks, you can’t really say fairer than that. The last in our guide is this awesome, dripping-with-nostalgia arcade-style electronic dartboard. 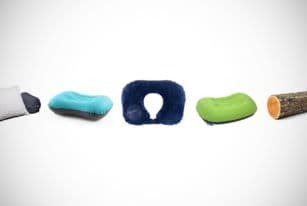 Unlike others, this does not need to be hung using any convoluted hardware or ineffective hooks, as it’s contained within a cabinet that’s impact-resistant. Yes, we’re totally going to ignore that humdinger of a price tag. Let us entrance you some more with just how cool it is. 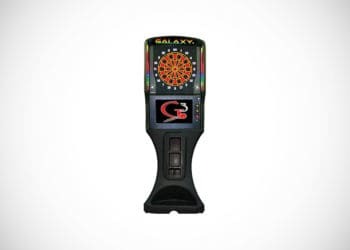 It is illuminated with a vibrant and dazzling tri-color LED, while the dartboard itself is set onto a 19-inch wide flat screen LCD monitor and is the full-size tournament-regulation 15-inch. You get the benefit of various game options and can play against other human players or computer opponents. Some of the most popular forms of darts can be played including double and single bull and 25/50. Really, this would make any man cave complete. As with all the other, more affordable dartboards, you get six darts, but also 500 spare .25-inch plastic soft-tips. If budget isn’t something you have to worry about, we’d suggest you get this in a heartbeat. Most dart boards are more or less the same, in terms of basic construction and layout. Depending on what you’re looking for from at-home darts games, there’s something to suit just about anyone. So, if you’re only interested in playing straightforward darts, there’s very inexpensive models that offer a basic number of games and scoring options. Whereas, if you’re looking for a more intensive and involved experience and are willing to pay a little more, you’ll be able to find an electronic dart board that provides an incredible range of gameplay options and scoring, as well as various skill difficulty levels too. While some simply light up, others make noises and have voices that are played if you miss the board or hit a bullseye. How many players will be playing at any one time? – You probably noticed that one of the key things that differs between electronic dartboards that appear to be the same is the number of players that they can accommodate. While some of the cheaper models will only allow up to six players in a game at a time, there are some that can maintain scoring for games featuring as many as 16 different players. Therefore, before spending your hard-earned cash, think carefully about how many friends and relatives will be playing and try to find the model that will accommodate your own social circumstances. Consider the quality of the board itself – While many of the boards in our guide are extremely high-priced, there’s a great deal that are available for next-to-nothing. 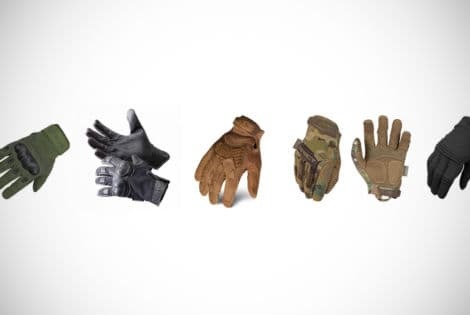 Although they may seem tempting, you need to think carefully before rushing out and buying them, because the price tag is not a clear indicator of the quality in terms of construction. Some cheaper models hold up against scrutiny better than others, that’s why it always pays to check out customer reviews alongside out overviews of these great boards. How serious are you about darts? – This is a relevant question to ask, because if you’re not especially serious about the sport, then what’s the point in investing in an expensive tournament-standard electronic dartboard? If you are serious though, then by all means go ahead and do it. We’re not your keepers! Darts can be a fun way to let off some steam and to enjoy some friendly competition between friends. Electronic dartboards add an additional level of entertainment to the game though, as we’ve hopefully shown from our guide above. 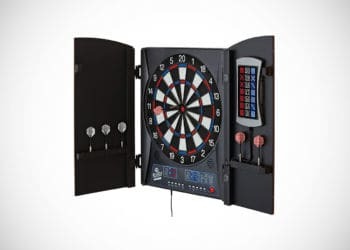 You can enjoy a livelier game of darts, even if you are just playing off against the computer in one of these great electronic dart machines. Scoring is where fun and games turns into murder and mayhem…or at least one buddy or uncle storming off in a grumble because they think they’ve been cheated out of some points. Simply because no one can really remember what the points where or because they weren’t jotted down on the chalkboard accurately. By leaving that side of it up to the computer, you can be sure of a more accurate scoreboard from start to finish. We hope that our guide, whether it’s the top picks or any one of the intriguing and exciting dartboards we’ve covered, helps you get what you’re looking for. We’re sure that your game room, man cave, home office or even workplace rec room could do a lot worse than have one setup. There’s a reason why darts has never gone out of fashion and if you’re new to the sport, it might just be time to find out why! 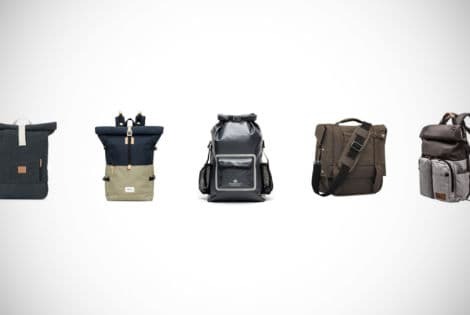 Looking for tech gifts or gadgets for men who have everything? We've piled the coolest list of best tech gadgets and gifts to buy in 2019.